ARLINGTON, VA, August 2, 2012 –PBS KIDS today announces that a new storybook app, SID THE SCIENCE KID Read & Play App for iPad, iPhone and iPod touch, is now available on the App Store. Based on the animated preschool series SID THE SCIENCE KID from The Jim Henson Company, and developed by iStoryTime, SID THE SCIENCE KID Read & Play features two storybooks, jokes, games, sing-along music videos, coloring pages and more, all aimed at developing early science exploration. “The Trouble with Germs”: Follow along as Sid discovers why he has to wash his hands to get rid of germs. While Sid can’t see them, his mom shows him a picture through a powerful microscope to explain that those itty bitty things do exist and can make him sick. “What’s That Smell?”: Sid finds out that smells, while invisible, are molecules that can pass through the air even without wind. That’s what allows him to smell his dad’s favorite pancakes, flowers and even his baby brother Zeke’s diaper (ewwww!). •Sing-Along Music Videos: Parents and children can sing along to songs from the show! •Coloring Book: Color different scenes and then save, or share or print them. •I Sense: In this fun interactive game, kids practice what they know about senses by identifying traits of different objects based on how they feel, smell, sound and look. •Sticker Book: Select from three separate scenes with different objects and characters for little ones to build their own scene. They can be saved to the photo album and shared with friends and family. •Spot the Difference: What’s different in each image? Kids see if they have an eagle eye and can spot the differences between two images. •Narration Options: Choose from Read to Me, Read to Myself and Auto Play. The SID THE SCIENCE KID Read & Play App is available for $3.99 from the App Store on iPad, iPhone and iPod touch or at www.itunes.com/appstore. PBS KIDS offers 18 apps, available in the App Store, covering curricular areas ranging from literacy and science to math and more. Through mobile applications, as well as online games, classroom resources, on-air programming, and curriculum-based toys, PBS KIDS offers educational content to all of America’s children, wherever they live, learn and play. More information about PBS KIDS’ apps is available on PBSKIDS.org/mobile. 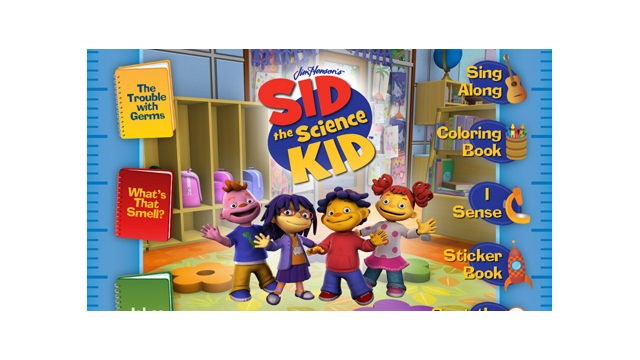 Images of the SID THE SCIENCE KID Read & Play App can be found on PBS PressRoom. About SID THE SCIENCE KID Each episode of The Jim Henson Company’s SID THE SCIENCE KID focuses on a single scientific concept that is presented using Preschool Pathways to Science (PrePS©), a practical science readiness curriculum used in preschool classrooms that was created by cognitive researchers and preschool educators, incorporating lessons learned from developmental research as well as classroom experience. The award-winning SID THE SCIENCE KID website (at PBSKIDS.org/sid) inspires kids to think like a scientist, with a kid-friendly video player, songs, games, activities, and materials. Accompanying lesson plans and at-home investigations can be found online at PBSTEACHERS.org and PBSPARENTS.org. About The Jim Henson Company The Jim Henson Company has remained an established leader in family entertainment for over 50 years and is recognized worldwide as an innovator in puppetry, animatronics and digital animation. Best known as creators of the world famous Muppets, Henson has received over 50 Emmy Awards and nine Grammy Awards. Recent credits include the Emmy® nominated SID THE SCIENCE KID, DINOSAUR TRAIN, WILSON & DITCH: DIGGING AMERICA and "Pajanimals." Features include "The Dark Crystal," "Labyrinth," "MirrorMask," and "Unstable Fables" and television productions include "Fraggle Rock" and the sci-fi cult series "Farscape." www.henson.com. Image Credit: PBS KIDS / TM and © 2012 The Jim Henson Company. All Rights Reserved.